The main sections of the course: make-up artist's tools, work with materials, face correction and modeling, eye, eyebrow and lip make-up, different make-up options: daytime, evening, wedding, photo and video make-up, theatrical make-up, body art, make-up of different years and much more. Active practice begins from the 3-rd lesson and from the 6-th future makeup artists try themselves in professional projects on theatrical, film and television platforms. A separate section of the course is devoted to marketing and advertising . Duration of the mandatory course is 112 academic hours. Classes are held twice a week for 4 academic hours, once a week is an optional course. After graduation, graduates have the opportunity to take part in additional classes and consult with the master without restrictions. Professional Makeup Course: ''Your future should be beautiful''. Introductory lesson: Excursion into the world of makeup. Characteristics of cosmetics, classification, purpose of each group of basic means, structure, features of textures, properties, application principles. Lesson 1: Structure and proportions of facial shapes and details. Principles of modeling. Light and shadow correction of the face and its details. Lesson 2: Fundamentals of colorimetry. Work with color circle. Theory of interaction between colors and color types. Color types. Lesson 3: Face correction. Classic daytime makeup. Lesson 5: Face correction. Evening makeup. Black and white makeup. Lesson 6: Facial correction. Evening make-up. Colorful. Selection of colors. Lesson 7: Eye Correction. Make-up for deep-seated eyes. Make-up for convex eyes. Eye correction rules when wearing glasses with eye magnifying optics, reducing the eye. Lesson 8: Eye Correction. Make-up for close / distant eyes. Eye make-up with lowered corners. Lesson 9: Marketing and make-up advertising. General principles, portfolio. Work with the clientele. Contacts. Lesson 10: Make-up for adulthood. Daytime, business makeup. The concept of "well-groomed face", "exlite makeup". Daily makeup. Makeup for shooting. Lesson 11: Evening make-up for adulthood. Make-up for solemn events. Make-up for shooting. Lesson 13: Wedding makeup. Bright. Lesson 14: Wedding makeup. Bright. Lesson 15: The crediting project of the basis course. Lesson 16: Face correction. Language of and glare. Lesson 18: Make-up "smoky eyes". Shade. From classic to glossy magazine. Lesson 19: Make-up of different epochs 1920s-1930s . Decadence. Cinematograph, NEP, the birth of "glamour" (Hollywood). Lesson 20: Make-up of different epochs ,1950s-1960s. A challenge to society. Lesson 21: Make-up on "supra". Make-up of the 1980s. Ruffle of color. Distribution of themes for the abstract. Lesson 23: Make-up for filming, TV and creativity. Lesson 25: Creating a stylish image for advertising. Lesson 27: Fundamentals of pencil technology. Lesson 28: Fundamentals of pencil technology. Working out. Lesson 29: Building your portfolio. Protection of abstracts. Lesson 30: The theory test. Lesson 31: Preparing for the exam. Lesson 2: Runway makeup. Creation of the concept together with the designer of clothes. Emphasis. Sidewalks. Aims (working on the topic on an optional day). Lesson 3: Art projects. Creation and goals of art-projects. Distribution of topics for the abstract (cult designers of the 20-th century). Lesson 4: Art Projects . Make-up for "Drag Show". Show-shows. Lesson 5: Applications. From salon to podium. Lesson 6: Structures in creative make-up.. Lesson 7: Pasty technique. Conceptual presentation of the image through an artistic technique. "Black Box"
Lesson 8: Performing the Black Box task. Shooting. Lesson 2: Theatrical make-up. Practical work. Lesson 3: Theatrical make-up. Fantastic, fairytale images, the use of latex, gummosis, overhead hair (wig, beard, mustache), overhead ears, nose, etc. Lesson 4: Theatre makeup. Practical work. Lesson 5: Movie make-up. Special effects: burns, wounds, cuts, bullet wounds, etc. Lesson 6: Movie make-up. Practical work. Lesson 1: Body art (according to the rules of the World and European Championships) Body art types for promotions, shows, filming, video. Techniques, tool. Lesson 2: Body art (according to the rules of the World and European Championships). Body art types for promotions, shows, filming, video. Techniques, tools. 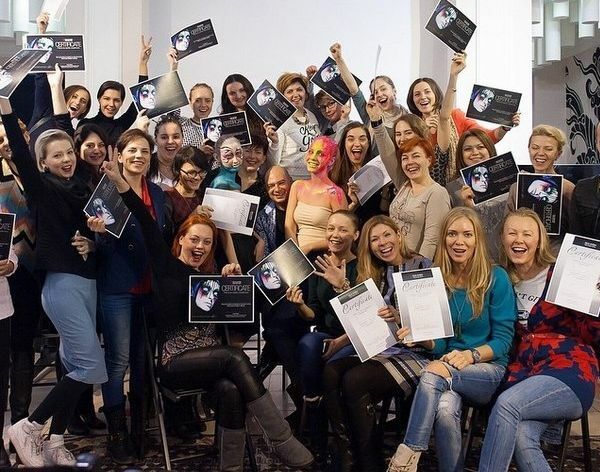 The course ends with examination works, according to the results of which the graduate receives a diploma of make-up artist of international level, as well as a diploma from the Ministry of Education. In the course of training you will not only learn how to use cosmetics professionally, but also learn a lot about the structure of your face and skin, the optimal colors for day and evening makeup, new trends and the latest achievements in the field of decorative cosmetics. Felix Stein will explain and demonstrate how to emphasize your strengths, hide your shortcomings, answer specific questions about makeup that I would like to ask a specialist. You can arm yourself with a photo or video camera to reinforce your skills later on. The course "Self make-up artist" will allow you to emphasize your own unique style and feel confident in the beauty world. Duration of the course: 4 academic hours. Course schedule: 1-2 meetings at a convenient time for you. The individual make-up course is what every woman should know and be able to do to feel irresistible! The advanced training course will allow you to improve your professional level in your spare time. This course is aimed at masters of make-up artists who have undergone professional training and is intended for creative people who have a fantasy and want to improve their skills to work in the field of show business, modeling business, fashion theaters, bride shops, etc. The course of professional development of makeup artists is focused on all those who seek to improve their skills and expand their professional knowledge and capabilities in the field of specialty. In the conditions of a rigid competition in the labor market it is impossible to allow itself to stop on reached. The process of training should go incessantly parallel to the life and work way. Our courses will help you to reach new professional heights, get a more paid position, improve your personal level. On a course of improvement of professional skill you receive all-round illumination of questions interesting you, the qualified consultation at experts-practitioners, possibility to exchange experience with the colleagues. The programme includes practical exercises in the main sections. At the end of the course it is planned to conduct credit work. Classes are conducted in small groups and begin as they are formed. 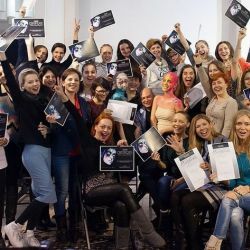 Graduates of the Professional Development Course receive the International Diploma of the FELIX SHTEIN School of Professional Make-up and begin to successfully apply new knowledge in their professional activity. Important!!! Some courses are subsidized! Check your rights to benefits and subsidies! Lesson 1: Advertising makeup. Conceptual creation of the image. Work with advertising agencies, stylists and photographers. From sketch creation to printed material (working out the topic on the day of the optional). Lesson 2: Runway makeup. Creation of the concept together with the designer of clothes. Emphasis. Sidewalks. Aims. (working on the topic on an optional day). Lesson 3: Art projects. Creation and goals of art-projects. Distribution of topics for the abstract (cult designers of the 20th century). Lesson 6: Structures in creative makeup. Lesson 7: Pastose technique. Conceptual presentation of the image through an artistic technique. "Black Box". Lesson 8: Performing the "Black Box" task. Shooting. Lesson 1: Theatre makeup. Picturesque methods of reincarnation. Lesson: Theatrical make-up. Practical work. Lesson 7: Battle of makeup artists. Creation of an image with picturesque methods. Lesson 8: Battle of makeup. Creating an image using special effects. Lesson 1: Body art (according to the rules of the World and European Championships). Body art types for promotions, shows, filming, video. Techniques, tools. your hair will make your image complete. Irreplaceable helpers - tools for creating hairstyles, styling tools. Practice: styling (straightening) of hair with a hair dryer and ironing. Use of rollers, overhead strands, hairpieces, traces. Practice: popular hairstyle with the use of hair. From classics to the present day. Elegance of the 60s. Practice: hairstyle on the basis of curls. Technique of performance of popular braids. Practice: universal variants of hairstyles on the basis of weaves. Dream comes true. Creation of a stylish image. Possibilities, variants, technical features, accessories. Practice: Wedding hairstyle based on long and medium hair length.